An hour and fifteen minutes after Illini basketball spokesman Derrick Burson alerted the media (via email) that Darius Paul had been suspended for the entire 2014-15 season; University of Illinois spokesman Tom Hardy emailed me a PDF of the police report documenting Paul’s arrest (embedded below). Paul is not charged with any drug offenses. One officer’s official report supposes that Paul was out looking to get some DMT. Another officer’s report contradicts that supposition, saying Paul was trying to get away from a guy who was attempting to sell DMT to him. This was the mysterious second suspect, the one who eluded police. A third officer (not involved in the pursuit or arrest) filed a report about a plastic bag. He describes finding the bag on the spot where Paul was tackled. He describes field-testing the bag for cocaine. The report reveals that Paul was tackled just outside his apartment building. Had he made it inside, he might have retained his athletic scholarship for the 2014-15 season. Considering the dollar value of that year’s tuition, room and board, and the potential dollar value of a successful high-major college basketball career, one begins to understand Paul’s reasons for avoiding police contact. Paul was also slightly injured in the altercation. 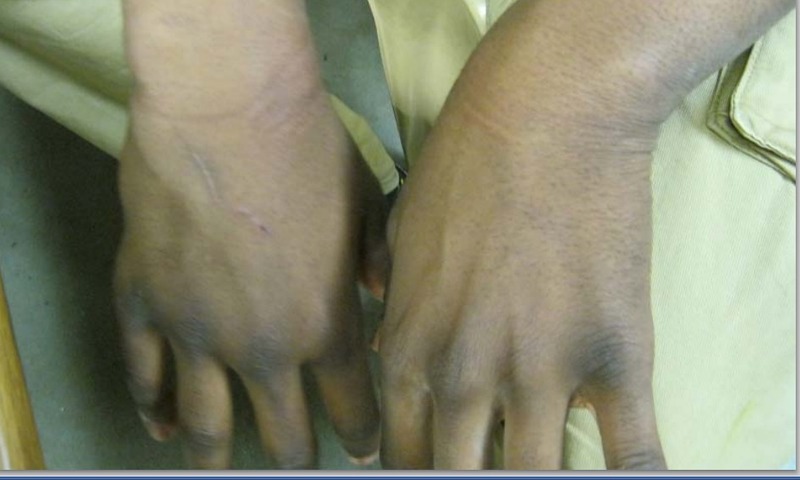 Police photographed his wrists to document the extent of damage caused by handcuffing. Officer Ortiz specifies the location of her attention as being “the alley south of the Illini Arcade.” Illini Arcade is an adult novelty and media retail store. 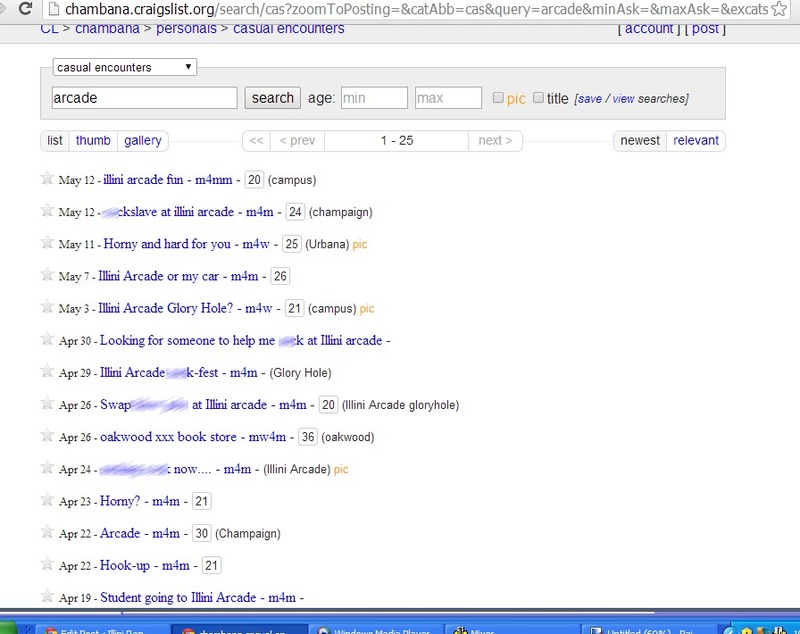 A search for [“Illini Arcade” + “personals”] on the front page of chambana.craigslist,org directs the user to the “casual encounters” page. Was Ortiz specifically monitoring foot traffic around the Illini Arcade? It’s possible that the university’s Division of Public Safety pays special attention to a meeting place for homosexual men. But unlike the old days of vice squad persecution, this attention would ostensibly be for the benefit of Arcade clients, rather than harassment of them. U of I police chief Jeff Christensen said there’s no particular focus on the Illini Arcade as a locus of criminal activity. Our officers regularly patrol the entire campus district which includes the area surrounding 25 E. Springfield Avenue. Although officers have extended jurisdiction and patrol duties beyond this area, we define the campus district as extending from University Avenue on the north to Windsor Road on the south, Race Street on the east and the railroad tracks just east of Neil Street on the west. Officer Ortiz and Officer Age were in this area as part of their general patrol responsibilities when the behavioral observations were viewed as documented in the report. Historically, there have been higher rates of robberies and batteries within the northwest quadrant of the campus district. This video (originally published in Saturday’s report on Kenichi Townsend’s arrest) shows the proximity of Paul’s apartment to the South China parking lot where Ortiz was staked out. The lot is on the west aide of the detention basin. The apartment building is on the east side. The Illini Arcade is on the north side. That John Groce changed direction, suspending Paul before the legal process had run its course, might be the most interesting aspect of this case from the big picture perspective of Illini basketball. Instead, Groce revoked Paul’s scholarship and banned him from all team-related activities just three days before Paul’s hearing was scheduled, and a day before it actually took place. Here’s the press release on Paul’s suspension. 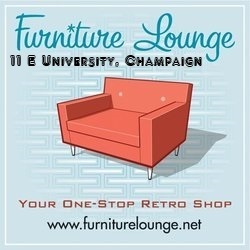 Champaign, Ill.­–University of Illinois head basketball coach John Groce announced today that sophomore forward Darius Paul (Gurnee, Ill.) has been suspended for the upcoming season. “Support” does not include an athletic scholarship. As required by law, the University of Illinois responded to my FOIA inquiry of April 24 which requested documents & information about Darius Paul, Arsenio Carter and Kenichi Townsend. A PDF of that report is attached at the bottom of this post. You’ll recall from my initial Illini Report offering that Townsend was jailed just hours before Paul’s arrest, and that Carter (Townsend’s alleged accomplice in an August 2013 robbery) is about seven feet tall, and weighs about 245 lbs. Thus, my theory that on the night Paul was arrested for resisting arrest, the officers who spotted him thought he was Carter. To give readers a better understanding of the locus in quo, I biked to the site of Darius Paul’s arrest, which is about a 5-iron from Darius Paul’s apartment. For readers who misinterpreted anything about the South China restaurant, its parking lot, its adjacent viaduct, or the railroad tracks that run atop it; I hope this video clears things up. University of Illinois spokesman Tom Hardy supplied a 37 page PDF file (embedded below) chronicling the investigation of Carter, and the investigation, arrest and interrogation of Townsend. Carter’s arrest is not documented, explained Hardy, because Carter was not arrested by University of Illinois police. Hardy identified Darius Paul’s arresting officers as Justin Age, James Scheel and Kaleb Schroeder. Officers submitting reports in the Carter/Townsend investigation and arrest were Eric Vogt and Ezzard Charles Hoskins, and Detective Cecil “Gene” Moore. If none of these names sounds like an Hispanic female to you, you’re right. According to Champaign County State’s Attorney Julia Rietz “Michelle Ortiz saw him first, the other guys stopped him.” Thus, you can infer that not everyone involved in either arrest is named in these reports. Remarkably, while returning from the South China parking lot this afternoon, I stumbled upon Officer Hoskins making an arrest. 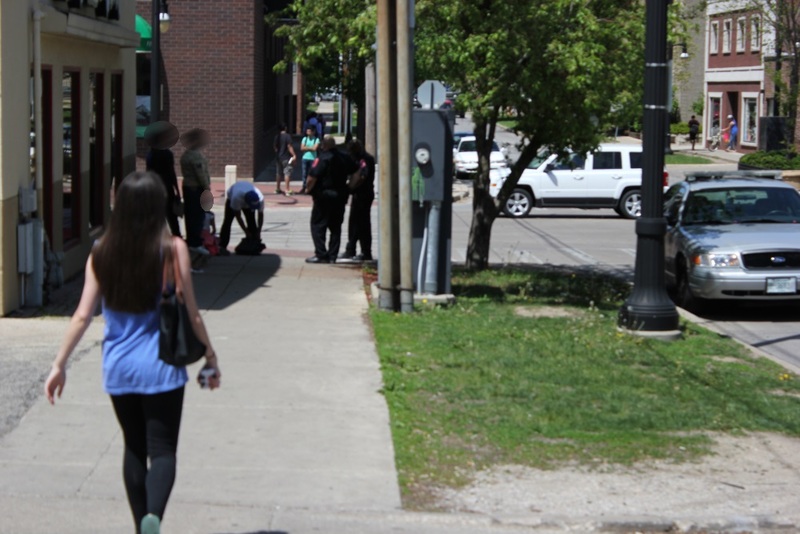 It occurred at the corner of Fourth & Green, in Campustown. Hoskins and his partner were so patient and calm with the man they arrested, I actually didn’t realize I was witnessing an arrest. From outward appearances, the police were helping the man, who was accompanied by four tweenaged children. Not until the arrestee yelled “don’t take pictures of my kids!” did I realize an arrest was taking place. The arrestee also yelled “don’t tell him nuthin’!” Hoskins invited me to leave, so I did. I’d wanted to ask him about his pursuit of Arsenio Carter, but suddenly realized it was a bad time. Were Darius Paul’s arresting officers aware that Arsenio Carter was willing to talk to police, but disliked being arrested? U of I police chief Jeff Christensen’s “Crime Alert” to the public is the FOIA response’s only memo indicating a department-wide awareness of Carter. But while officer Hoskins recognized Carter from experience prior to August 2013, the Christensen memo demonstrates a departmental directive for all officers to be on the lookout for a seven foot black man, known to roam the streets near Springfield Avenue around 3 a.m.
Kenichi Townsend didn’t squeal during his 2013 interrogation. When asked to identify his companion in the surveillance video, he obfuscated before invoking his right to counsel. And although Townsend was in custody when police wrestled Darius Paul to the ground, Townsend is no longer listed on the Champaign County sheriff’s inmate search website. If local law enforcement hopes to turn Townsend and Carter against one another, it currently lacks any leverage to do so. The 2013 robbery may go unpunished, despite officer Hoskins’ excellent police work. There’s no legal relevance of the Carter and Townsend cases to the People v. Darius Paul. Perhaps the police thought they were tackling Arsenio Carter, but that supposition doesn’t diminish Paul’s 4th Amendment rights. The question is whether walking in a parking lot within view of one’s own apartment is reasonably suspicious to give rise to a Terry stop. Details of Paul’s arrest and interrogation will not be available until the investigation is closed. Now, here’s the PDF covering documents and reports relevant to Townsend and Carter. For some reason, the race of the 2013 victim was redacted from the report.